Captions and subtitles are a critical tool that makes information more accessible to those with hearing loss. The technology is constantly evolving, especially real-time captioning that can be available on the go, often using smartphones. The 1990 Americans with Disabilities Act requires businesses and public venues to guarantee that people with hearing loss are not excluded from or denied services because of the lack of auxiliary aids, and this includes captioning. But sometimes the subtitles fall short, creating unintentionally funny gaffes that can end up going viral. Without intending any criticism of this important accessibility method, which is so helpful for those with (and without) hearing loss to better understand speech, we are launching a fun contest— because everyone loves bloopers, and it’s a good reminder that captioning has actually improved by leaps and bounds. Submit an original photo or screenshot of a memorable caption flub, and earn a chance to be featured in the Spring 2019 issue of Hearing Health and on our website. The deadline has been extended! Visit hhf.org/challenge to review the full contest rules and to enter. 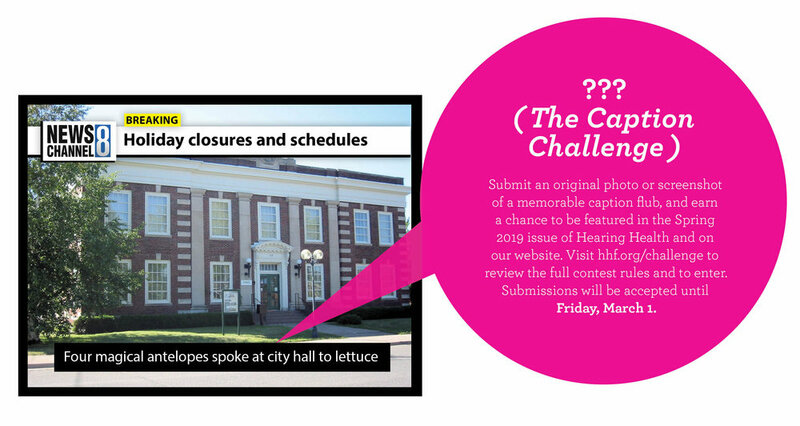 Submissions will be accepted until Friday, May 15. Note: The contest is open to all individuals 18 years and older who subscribe to Hearing Health magazine via print (in the U.S.) or online (outside of the U.S.). Nonsubscribers are not be eligible for participation and any submission from a nonsubscriber will not be considered. To subscribe to the free quarterly, visit hhf.org/subscribe.